The villa has three bedrooms each of which has its own private full size bathroom, The 'Master Suite' with its king-sized double bed, the 'Garden Room' with its twin beds, and the 'Poolside Room' which can be arranged as either a Super King or Twin beds. Step out through the sliding French windows of the poolside room onto the lower terrace beside the pool. All the bedrooms enjoy lots of built-in wardrobe space with supplied hangers. There is also a further wc and shower room in the villa for general use. The kitchen is extremely well equipped. Fitted with a dishwasher, microwave, fridge/freezer, coffee maker, and a full sized oven with a ceramic hob. Of course it has a full set of cutlery, pans, dishes crockery, and glasses of all types. In the Solana next to the kitchen there is a washing machine with your own private drying area. For use around the pool there is a good collection of plastic plates and glasses available. The lovely lounge is adorned with high quality paintings, and with a large picture window looking over the ocean and island of Furteventura. The villa has the latest thin-flat screen HD television with the latest web based television programs system, allowing you to enjoy lots of English speaking channels including BBC 1, BBC2, BBC News, ITV, Sky News, Sky One, etc. and some other language programs too ... in fact up to an amazing 299 channels! There is also a CD and MP3 player. A DVD Player with an excellent collection of villa videos including many of the latest feature film releases. Also a 'leave-one/take-one' book library. Obviously Wi-Fi is installed for you use too, at an additional charge. Casa Hawkeshead's two large and spacious terraces both south facing with tables and chairs, give you the option of plenty of shade during the day if required whilst still enjoying the ambiance of this villa's lovely setting. The upper terrace offers you the sun right up to the evening; perfect for alfresco dining and late relaxing drinks. If you enjoy swimming, the villa has one of the largest private villa pools (11x4 metres) on the island. Heated throughout the year by solar panels, there is also a back up heater (for an extra fee) in the cooler winter months. 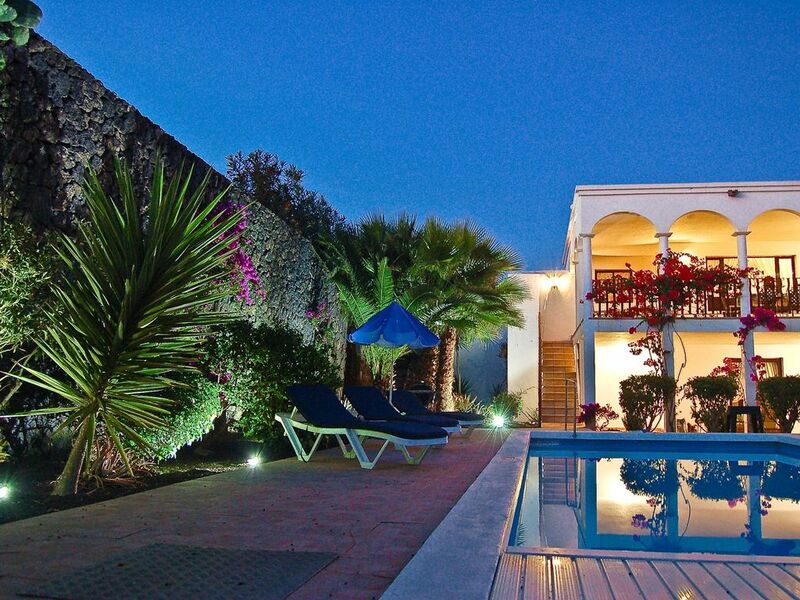 The pool has lovely tropical styled gardens with its own automatic son-et-lumiere each night! By the pool there is a fabulous large Canarian BBQ for those warm 'barbie' party evenings. This villa is unique in its design and would suit a family or group of friends wishing for a relaxing, quieter holiday. However due to the many stairs/steps we feel this villa may not be suitable for young children or guests with physical disabilities. This is a STRICTLY NO SMOKING villa. AIRPORT TRANSFERS are available both SHARED and EXCLUSIVE. We can arrange this at very reasonable rates for our guests, please ask for a price list. CAR HIRE. We can arrange to have a vehicle of your choice awaiting your arrival at the Arrecife airport in Lanzarote along with the company representative or, if you prefer, have it delivered to your villa at a time of your choosing. The company will also collect from the villa or, should you choose to do so, you can drive it back to the airport yourselves. The permutations are entirely yours. PRICES DIFFICULT TO BEAT. Send us your car hire quote ... OR ... if you look on our website you will find CAR TRAWLER (under car hire). This takes you through the entire range of car rental companies at Lanzarote Airport. You can then search on line, compare all the local deals available for your dates and book directly online with any of the companies. All the big names are there. Playa Blanca is only a 30 minute drive from the airport. WHERE TO EAT. Locally in Playa Blanca there are many good restaurants to choose from. Those along the sea front are great for their ambiance, but when asked to recommend one, there are two which remain consistently good and are all family owned and run. Los Hervideros … great for local tapas. Casa Brigitta (in Marina Rubicon) … ask about the fish of the day. We are also really pleased to be able to offer the services of a personal chef. Ask us for more information about his BBQ packs, tapas or paella evenings plus much more. Details are in the villa. A WELCOME PACK consisting, of tea, Water, Sugar, Orange Juice, Beer, Coffee, Milk, Biscuits, Wine/Cava is included in the above prices. You can also order free delivery of readymade meals for your arrival, please ask us for the menus. Overpriced, dated and rather tired. Pictures misrepresent the reality. Avoid. This is not a prestigious villa despite the marketing material. This was our seventh time in Playa Blanca so we know a good villa when we stay in one and this villa certainly was not. Damp issues in bedrooms - wardrobes, draws, bedside cabinets unusable as had strong damp musty smell, managing agent offered air freshener! Not fully clean on arrival. Villa past it’s hay day (when photos taken many years ago I expect), needs maintenance and modernising. Outside furniture either rusty or heavily stained including railings. Pool not fully heated on arrival, pool cover broke down on day 1. Lost all electricity twice even although fuse board had not tripped out. Master bedroom window leaked during heavy rain, extractor not working in en-suite, bed uncomfortable with dips, gave us both bad backs. No air conditioning nor mosquito nets so you either cook or get eaten alive (regardless of ceiling fans). Woken twice in early hours by rowdy neighbours. Wi-fi range very limited, bandwidth poor to the point that streamed films stutter/freeze frequently, managing agent suggested we simply reboot the router! Outside terrace nice with lots of space and cover. Showers hot and powerful but insufficient for 5 people of an evening/morning. Pool majority shaded by ~2pm due to 3 large palm trees at end of garden and large wall on side. Feel we were mis-sold, very disappointed. The villa was perfect for our family with a lovely pool and garden. The villa was well maintained and had everything we needed. Good beds and great supply of towels. The terrace areas were lovely to sit in and watch the kids in the pool and take in the sea views. Only downside for us was that it was a little too far to walk to restaurants/decent sized supermarkets. Villa very spacious, clean and comfortable. Everything you could need for a relaxing holiday. We went for a week with our children 23 and 20 had a lovely time . Would definitely book this villa again , staff very helpful from start to finish . 1. Rates are based on 2 people. Please add an additional £77 perperson per week up to a maximum of 6 people. 2. For your comfort from 1st&nbsp;October to30th&nbsp;April use of the electric pool heater is FREEand will give an approximate water temperature of between 26º to28º C - weather dependant. If you would like additional poolheating during the summer months, please add an additional £100 perweek. 3. Cots and highchairs are available to rent from a localcompany. They can be pre-ordered and waiting for you at the villaon your arrival. These cost €25 per item per week payable onarrival. PLEASE NOTE: If you are travelling with a small child, wedo not provide bed linen for cots due to the sensitive nature of achild's skin and the risk of allergies. 4. All holiday bookings are subject to a 5% service fee. Adeposit of 15% of the total holiday price must be paid before theholiday booking can be confirmed. The balance of the holiday priceis to be paid via Credit/Debit card or Bank Transfer and must bereceived at least 8 weeks before the holiday start date. 5. PLEASE NOTE: We ask for a standard £400 REFUNDABLESECURITY DEPOSIT on any booking to cover damage that may occurduring your stay. This is payable either in cash on arrival or viabank transfer two weeks before your holiday starts. However, wehave a "BREAKAGES INSURANCE POLICY" in place and for a small fee of£7.50 per guest, per booking (non-refundable) your party will becovered for the first £500 of any damage caused and negate the needto pay a security deposit. 6. Unlimited WiFi access is FREE.